Prime Minister Ranil Wickremesinghe said yesterday that Sri Lankan universities should climb up the rankings if Sri Lanka is to reap the benefits of the Fourth Industrial Revolution through the knowledge-based system and approaching the new economic patterns. The present government has modernized the country’s education system. “However, we should also be modernized within Asia. Therefore, we must initiate collaborative work with foreign universities to propel knowledge and enhancing the international standards in our universities,” he added. 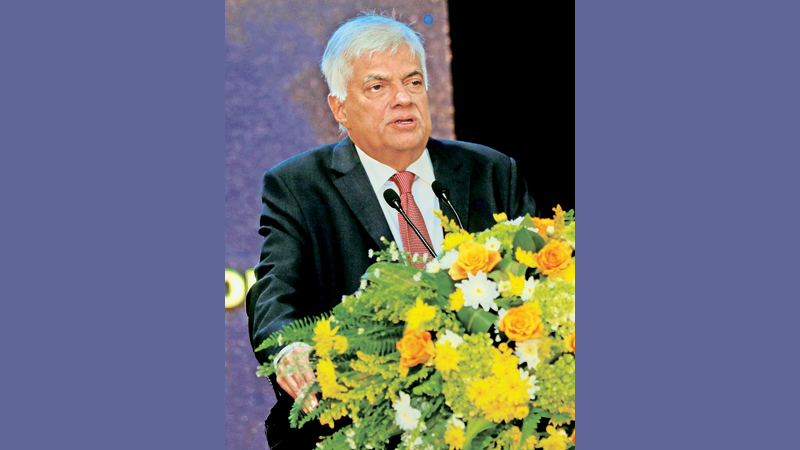 Prime Minister Wickremesinghe made these remarks addressing a gathering after opening a new auditorium of the Faculty of Graduate Studies in Colombo University. “At one time, the Colombo University was on par with the Oxford and Cambridge Universities in UK. However, today our universities are not in those rankings while the Oxford and Cambridge Universities still occupy the top spots in a global ranking for the best universities in the world,” the Prime Minister said. “In Sri Lanka, only a few universities can be developed to meet the requirements of the Fourth Industrial Revolution and we must strive to do that. We must introduce new sectors and studies like Nanotechnology, Information Technology, and gene technology to universities. There is a lack of skilled workforce for the service and industrial sectors. We must produce the required workforce to cater to these sectors through the universities,” the Prime Minister added. “At one time, the Peradeniya and Colombo Universities were the top in the list of best universities in Asia. But, today, the National University in Singapore is holding the ranking of Asia’s best universities. Universities in China, India, and Korea have come to the front rankings today. In those countries, the education system has achieved significant improvement on par with economic growth. But our education system and economic sectors have faced setbacks. Education and higher education systems should be improved in Sri Lanka to cater to the requirements of the fourth industrial revolution. We must improve the entire university system including the standards of graduates’ studies to achieve these goals,” he added. The Premier said they have now introduced a “smart class” concept to modernize the country’s education sector in keeping with the 21st century. As another step of modernization, the government has provided tabs to schoolchildren. “These concepts pilot the modernized education system which will be established within the next 10 years. We will also provide the necessary teacher training facilities to realise this task,” he added. The Premier further said that the Colombo University has shown tremendous progress during the past few decades. The present Vice-Chancellor who rendered a yeomen service to the university is due to retire in the coming days. “That is why I came here today. When he joined the University I was about to leave it as an Attorney-at-Law. He asked me to lead the student campaign in the university those days,” he said. “Most of my batchmates are holding very high positions in the country today. We must go forward to achieve many targets in the future. The government expects to make necessary changes to improve the education and higher education systems within the next five years,” the Prime Minister added. City Planning, Water Supply, and Higher Education Minister Rauff Hakeem said the government has made a massive investment to improve the infrastructure facilities in the higher education sector. Around 80 hostels have been constructed to cater to the accommodation needs of 75 percent of the university students within the last four years.